Fits Atomlab 500 Dose Calibrators. The Biodex Germfree Portable Shielded Isolator provides the ultimate in both product and operator protection. The shielded isolator functions as a "glovebox" using negative pressure to meet NIOSH recommendations while complying with USP<797> regulations for use outside a cleanroom. HEPA filtered unidirectional (laminar) air bathes the work area to protect the product from contamination and removes any particulate generated by sample manipulation. 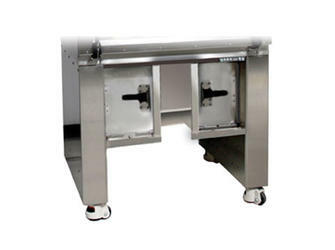 The operator is provided a complete shielded barrier from materials being manipulated in the work area. The Biodex Germfree Shielded Isolator meets or exceeds ISO 14644-1, ISO Class 5 (Class 100) air quality. Each shielded isolator undergoes rigorous physical testing to assure the unit meets performance requirements as validated. It is required that independent certification be performed before use. What is a Barrier Laminar Flow Isolator? According to the Food and Drug Administration, a barrier isolator is "a decontaminated unit supplied with HEPA filtered air that provides uncompromised continuous isolation of its interior from the external environment, including surrounding cleanroom air and personnel." By installing a certified barrier isolator, one can obtain cleanroom conditions within a contained workspace. Barrier isolators provide a ISO Class 5 (Class 100) environment for product preparation, with work occurring inside a closed, pressurized environment accessible only via sealed gloves that reach into the work area. A Shielded Glovebox is not a certified barrier isolator. By choosing a certified barrier isolator, the requirement for a ISO Class 8 environment is eliminated. The Biodex Germfree Isolator is an excellent example of a well-designed shielded barrier Laminar Flow Isolator, meeting all standards and more. Sealed two-door air lock maintains complete environmental separation between work area and ambient conditions. HEPA filtered purge of trapped air lock air eliminates cross contamination between the work area and the room during both material ingress and egress. Full framed, standard size mini-pleat HEPAs filter 100% of inlet and exhaust air from both the work area and the antechamber to provide a fully contained environment. HEPA filters are full coverage and front loading for easy replacement by a certifier. Hydraulic assist height adjusting stand offers a full 10" range, allowing operators to sit or stand comfortably for extended time periods. Stainless steel sliding tray inside the antechamber air lock that pulls forward for loading and unloading items into the air lock, eliminating reaching strains. The sliding tray lifts up 7.5" when the interior antechamber door is opened. Extra large, oval glove ports are placed with bottoms together to provide an anthropometrically correct configuration that accommodates a wide range of body types and increases range of movement. Glove ports have a 3" armrest to reduce operator fatigue. Large viewing panel is at an angle to reduce glare and operator strain. One sharps container in a locking shielded holder, located under the isolator in individual .25" lead shields. Sharps tube is a straight 2.5" diameter tube to facilitate quick drop of the largest syringes with an easily removable shielded seal/stopper to maintain work area containment. Lockout handle requires key for access to work area and sharps container. Inward face velocity is 95-100 LFM at gloveport opening, to protect operator/product during massive breach of containment. Locking casters are standard; seismic anchors are available. Front viewing panel is top hinged and self supporting for easy access to the work area for cleaning and equipment ingress and egress. All filter diffuser / guard panels are removable for easy cleaning. Straight sides and back maximize work area to accommodate the many types and shapes of equipment and dose calibrators. All corners in work area, antechamber and work surface are easily reached and cleaned. Overall work area pressure is negative with the option to externally exhaust. Fits Atomlab 400 and 500 Dose Calibrators. – Overall Dimensions: 36" w x 32.5" depth x 79 " h (91.4 x 82.5 x 200.7 cm) Designed to fit through standard door openings and elevators. Fluorescent Lights: High efficiency; externally mounted to minimize heat build up. Separate lighted power ON/OFF switch. Motor/Blower: High capacity with speed control to extend HEPA filters life. Separate lighted power ON/OFF switch. Power: 115 VAC, 60 Hz (Optional 220 VAC, 50-60 Hz is available), 15 AMP line, running amperage = 6 AMP. Includes ten foot hospital grade power cord with molded grounded plug. Sealed outlet in work area. *Offer applies to United States only. The Total Customer Care Plan is a package that ensures continued top performance of the Isolator.